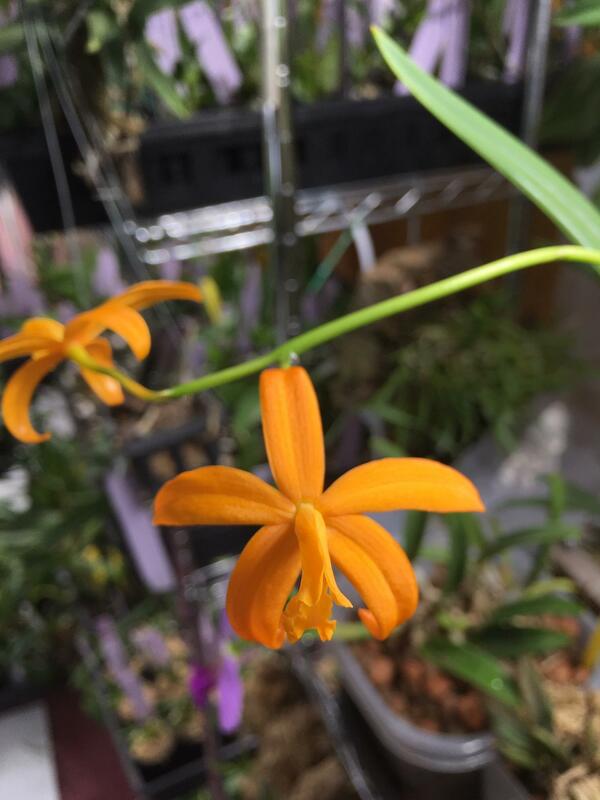 C. harpophylla x C. angeri - Orchid Board - Most Complete Orchid Forum on the web ! I got this little one from SVO last year. This appears to be its second bloom and it's still a young little thing. I hope the shape improves on the blooms as it matures - both blooms lips are cocked to the left and the petals/sepals curl back (though that could be cultural). Despite that, they have grown on me in the past couple days anyway. I've gone from 'It's okay' to 'ooo, look at those dainty little blooms!" Last edited by Salixx; 02-04-2019 at 09:09 PM.. Very nice orange. Too bad us Aussies haven't got a SVO-level nursery. I imagine it would be orchid shopper paradise there. How do you care for it, Sallix? I pretty much treat it like any other Catt alliance plant. It's grown in a bright window or and/or under lights (depending on the time of year). Intermediate to warm temp - right now it's typically 60F nights and 70-75F days. I grow it in Semi-Hydro, before that it was in a fine kiwi bark mix with perlite that I watered when dry. In my lower humidity and warmer environment I had to water daily. Can't find any Catt. angeri in Orchidwiz. Probably it's Cattleya angereri Even though, can't find any cross between these two. Last edited by rbarata; 02-03-2019 at 09:31 AM.. Both parents are rupicolous Laelias from Brazil. You are right, I keep saying the name wrong in my head and passed that on to my post title. I’ve corrected it.